Handmade Silver Wedding Ring : LOVE2HAVE in the UK! 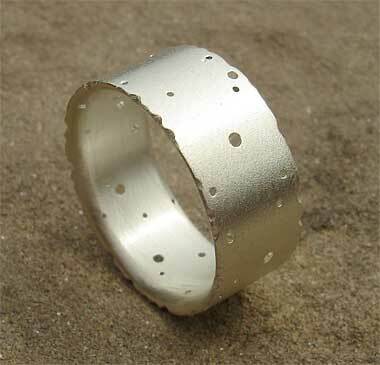 A textured handmade wedding ring made of solid sterling silver. This ring features the same exquisitely handmade textured surface that features on both the diamond set 7mm and 10mm versions of this model listed in our diamond rings section, and it is due to their widespread demand that we now feature the plain versions of these rings also. The texturing is similar to that of the surface of sand or even dust. The subtly pitted texture looks like sand or dust sprinkled onto the silver. 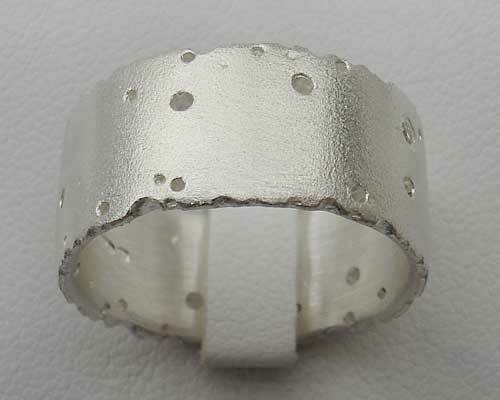 The ring also features small drilled holes which add to its designer styling. This ring makes a great unisex wedding ring and is approximately 10mm in width and its delicate styling suits narrower women's fingers. A 7mm width version is also available.